I am so grateful to have spent last week immersed in Liberating Structures with a team of powerful micro-structuralists, UBC CTLT collaborators, and 100 incredible participants from higher education, health care, and beyond. Activities? Facilitation Techniques? Magic? Complexity Theory? Yes, and…! Since my own Immersion Workshop experience, I slid into the habit of thinking of Liberating Structures as very powerful – indeed, the best – facilitation moves. This week I was reminded that they are also ways we can change the world. Really. You could feel it in the room… people were excited, plus maybe a bit freaked out (?) by the potential to really transform everything by changing how we relate to each other. It feels big. 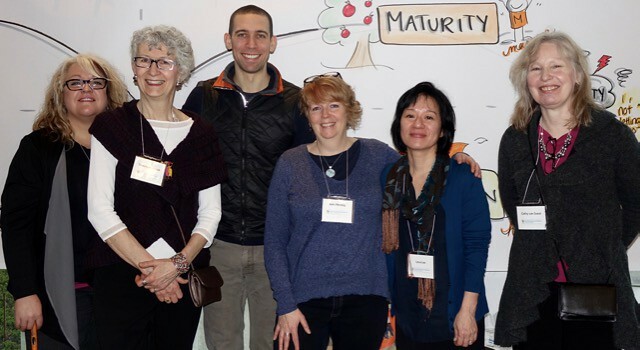 Our design team of 7 “micro-structuralists” worked together to plan and help facilitate the 2.5 day workshop (pictured above from left: me, Shauna Fenwick, Fisher Qua, kele fleming, Leva Lee, Cathy van Soest, not shown: photographer Keith McCandless). If you are into behind-the-scenes details, we had three 1.5 hour group design meetings in the months/weeks leading up to the workshop, a google doc with notes, a gigantic powerpoint, several emails, and we worked in (different) pairs to plan and lead each structure/activity. We began with the LS Selection Matchmaker, what we “hoped and believed was possible” for participants, and a handful of Wicked Design Questions that got us thinking about how to attend to important opposites in our design (e.g., how can we ensure participants learn breadth and depth, theory and practice, etc). Our team had varying degrees of experience with Liberating Structures, and we paired up to spread the experience around. In addition to the design/facilitation team, we were fortunate to work with two fabulous colleagues from CTLT on organizing/logistics – Emily and Sukhi. Their focus, professionalism, experience, local knowledge, tact, patience, and efficiency was a learning experience in itself. I aspire to be as good at organizing events as they are! Further to team work, I so appreciated the feedback and mentoring that went on among our team throughout our time together. Lots of in-the-moment encouragement and ideas for next time were shared. That dynamic made me feel noticeably alert and awake about my practice. Keith and Fisher have a wicked gift of being expert/experienced AND working with novices as colleagues. I want to get into the habit of offering and receiving feedback at work more often. Venues need Liberating Structures, too! As I continue to do this kind of work, I appreciate how comfortable, beautiful, well-designed spaces supports the experience and learning. Fixed seating and rows are far less common today (hooray! ), and we still can do much better at supporting visual practices and working together on walls. Many beautiful teaching and learning spaces in higher ed institutions are still organized around The Speaker and The Delivery of a(PowerPoint) Presentation – this is a conventional structure that needs liberating! So forget about vision, mission, BHAGs, etc (it was even suggested that “vision” and such statements can make organizations more vulnerable). Purpose helps us figure out what to do, what not to do, and what to stop doing (i.e., what to creatively destroy). a user group is forming for those interested in exploring and sharing online applications of Liberating Structures. Leva and I can cross an item off our professional bucket list. We really wanted this workshop to happen, and by all accounts so far, it was a great success. We are so thankful to Keith, Fisher, CTLT, BCcampus, and all our colleagues from higher ed, health care, and beyond who came, and who will help us continue this important work.